This helicopter flight is a real treat for architecture lovers. Unveiling a number of styles including neo-gothic and art deco, aerial views of downtown Detroit is a sight to behold. This helicopter flight is a real treat for architecture lovers. Unveiling a number of styles including neo-gothic and art deco, aerial views of downtown Detroit is a sight to behold. See the city’s famous towers such as Cadillac Place and Wayne County Building from hundreds of feet above the cityscape. Apart from the skyline, the flight takes you to the nation’s biggest public park, sprawling bridges and even a few famous homes. See it all! 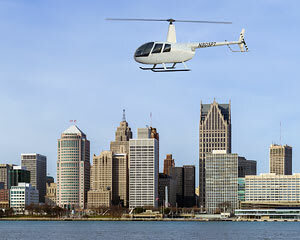 Take a 30 minute helicopter flight over Detroit. Explore the city skyline and learn all about its diverse architectural styles. Get amazing views of the Ambassador Bridge, connecting us to our brothers from the North. Swoop over the homes of rock stars! Enjoy amazing overhead views of Belle Isle, designed by the great Fredrick Law Olmsted. Learn all about Detroit’s 300-year-old history from your pilot! Detroit was, is and always will be a city that builds things. See its legendary achievements from a remarkable perch and bring a camera to capture every moment. Book the adventure now! A great gift idea, we had an amazing time.